“Try this, it’s nice”, she says. “OK”, I think, “it’s only a hotdog. Nothing strange here. Perfectly normal food”. Yes, those are tiny octopus tentacles sticking out of it. This entry was posted on September 1, 2006 at 22:35 and is filed under Food, Japan, Photos, Travel. You can follow any responses to this entry through the RSS 2.0 feed. You can skip to the end and leave a response. Pinging is currently not allowed. Christ on a bike! If you bit into your “hotdog” in the West and found that you’d sue! Somehow that just looks utterly delicious. 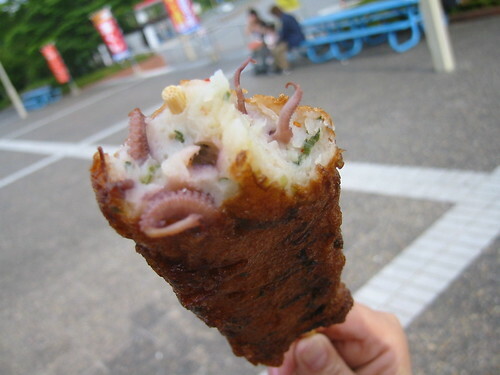 I am very interested in speaking with the person who made this Octopus on a Stick. I am casting for a new series on SPIKE TV called FrankenFood. Would love to speak with the chef of this food as soon as possible. It was at a roadside restaurant / service station somewhere between Fukuoka and Nagasaki. Sorry I can’t be more specific; it was several years ago.